Welcome back to our blog. There are many factors that can either contribute to or can relieve the symptoms Lyme disease patients experience, and your diet is one of them. One of the most common symptoms associated with this condition is chronic inflammation, which may affect the nerves, joints, muscles, and digestive system. Therefore, eating foods that combat inflammation can help reduce pain, discomfort, and limited mobility caused by inflammation. Last time, we started looking at some of the best foods to incorporate into your diet to fight inflammation caused by Lyme disease. 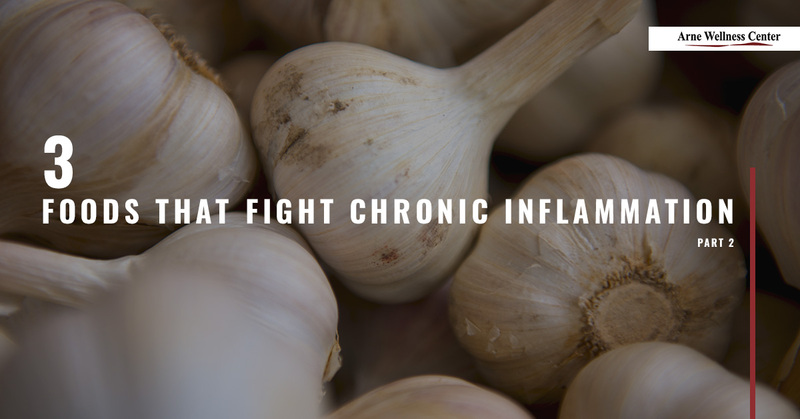 Let’s look at three more foods that can naturally fight inflammation in the body in today’s blog post. Whole grains like brown rice, raw oats, rye, wheat, and quinoa, to name a few, are rich in antioxidants, packed with nutrients, and are an excellent source of fiber. When whole grain foods are refined, they lose much of their nutritional value that can help reduce inflammatory hormones in the body. Therefore, eating whole grains provides the body with fiber and other nutrients that actively fight inflammation, along with supporting a strong heart and immune system, and a healthy gut, where 70 percent of the cells that make up the immune system reside. Whole grains can also help you stay fuller for longer which can curb your appetite, and help you avoid reaching for processed foods to snack on, which actually contribute to inflammation. As part of the alliums family, garlic and onions contain high amounts of quercetin, a powerful antioxidant that naturally fights inflammation. Garlic stimulates anti-inflammatory proteins in the body, and contains sulfur compounds that support a healthy immune system to fight off diseases. Onions also fight off free radicals and help reduce joint inflammation. Add these flavorful and nutritious ingredients to salads, whole grains, and other healthy foods to fight off inflammation caused by Lyme disease. Vitamin K is an excellent nutrient for curbing inflammation. Eating leafy greens like spinach and kale will not only provide you with vitamin C, E, and K, but also with carotenoids, a class of phytonutrients or plant chemicals that act as antioxidants in the body. Antioxidants have powerful anti-inflammatory properties to relieve inflammation in joints and muscles as a result of Lyme disease. Along with spinach and kale, cauliflower, broccoli, and Brussel sprouts feature anti-inflammatory properties such as vitamins A, C, D, and K, and manganese, and fiber. Leafy greens are some of the best ways to both fight inflammation naturally while also supporting a healthy immune system because they are delicious and incredibly versatile. Combing a healthy, antioxidant-rich diet with natural treatments such as chiropractic care, massage therapy, acupuncture, and nutritional counseling are all excellent ways to reduce chronic or low-level inflammation caused by Lyme disease. If you would like to schedule with a Lyme-literate doctor in the Littleton area, contact Arne Wellness Center today. Lyme disease can affect many aspects of your life, however, there are many natural Lyme disease treatments for effectively treating this common condition. Join us next time as we continue exploring more of the best foods for fighting inflammation and call us today for an appointment.